Genuine OEM Brother Ink Cartridge, Cyan, 400 page yield. Brother part number: LC51C. Compatible Brother Ink Cartridge, Cyan, 400 page yield. Replaces Brother part number: LC51C. Compatible Brother Ink Cartridge, Magenta, 400 page yield. Replaces Brother part number: LC51M. Compatible Brother Ink Cartridge, Black, 500 page yield. 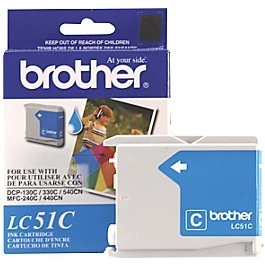 Replaces Brother part number: LC51BK.